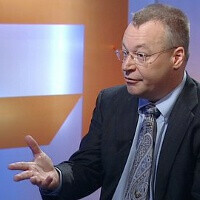 Nokia's demise has more people questioning: is Stephen Elop the worst CEO ever? You know one company that is in dire straits these days? You might think RIM, and you’d be right it’s in huge trouble, but there is another company that slumped so spectacularly we are still trying to wrap our heads around how it's even possible to lose so much market share so quickly. We’re talking about the Finns from Nokia, under Stephen Elop. Ever since the release of the "Burning Platform" memo to all Nokia employees, the ex-Microsoft office head and now chief executive at Nokia, Elop polarized opinions. While initially some were trying to make a point that the CEO just brought up the truth, now, it’d be hard to find someone thinking that this was not one of the costliest mistakes of a chief executive ever made. At the time, just over a year ago, Nokia was selling nearly twice as many smartphones as Apple and more than three times more than Samsung. Now, in just a year, Nokia sells around four times less smartphones than Apple and Samsung. So what happened? Was this a terrible mismanagement? And should Elop be fired immediately? One person has been making the case from day one of the announcement of the Windows Phone adoption and the Burning Platform memo, and while he was a lonely voice a year ago, it seems now that the facts have stricken, investors might want to listen closely to what he has to say. In a massive, 29,000-word breakdown of the management errors of Elop, Tomi Ahonen, ex-Nokia executive turned analyst, shows how the Nokia CEO misquotes ancient philosophers, collapses employee confidence and mind-bogglingly refuses to sell a device, even when he has proof that it would bring Nokia profits. We won’t spoil the whole thing and there is definitely some bias and hurt Finnish pride in Ahonen’s words, but the stubbornness and loudness with which he presented his case in the past year definitely deserves attention, now that Nokia is burning its last cash and literally on the verge of collapsing. Hit the source for an interesting read, and also check out Ahonen's comparison of MeeGo and Microsoft’s Windows Phone right after it. What do you think, should Elop be fired or do we still need to wait to see Nokia’s Windows Phone 8 devices come and save the day? Is Stephen Elop the worst CEO ever? Yes. He has been working for MS all this time! Microsoft wanted a mobile partner and send Elop to get Nokia for them! There's no word that describes my anger for Elop and Microsoft! Elop was/is a Trojan horse for MS. MS wanted a smartphone company to be able to compete with Apple. Nokia was too expensive at the time. Plan B was to drive the value of Nokia down into the toilet. They have succeeded admirably. The Surface shows that MS intends to compete in the tablet space with iApple with an internal product. The same is going to happen with Smartphones. It is just a matter of time. Maybe by this time next year, Nokia will have sold the smartphone business to MS.
Bingo....someone hit the nail right on the head! Nope Ceo Stephen Elop has done it's job superbly , As an agent of Microsoft . He has done super, down the toilet 3 competing OS's of Microsoft, down the toilet a independent highly skilled European developer-team, down the toilet the competitive QT , down the toilet user platform " OVI" etc etc He salary of x milj Euro /year is well spend. whoa whoa whoa... we never accepted him into the darkside. hes on his own. He shoulda: Stayedd focused on Meego. Went with Android and WP. What was it gonna hurt doing an Android phone too? What did he have to lose? He went with WP and that was gonna a long climb back up the hill already. Hmmm... I think it's one-sided comparison. I really want to try WP7, but there's too much bad review for it. Specially in comparison with Android, which is a very flexible OS. I want to try MeeGo, but I'm afraid the N9 phone is now becoming rare, as Nokia looks like doesn't want to support it anymore. Bad review? Should look at user rating and experience review. After checking out Meego, my first impression was it had the potential to be the next Android. Their developer community was growing and doing some amazing things, reminded me of what Cyanogen was doing in many ways. I hope they can get it off the ground and make it a serious competitor, as consumers we'd all benefit from having more choice. All the love for Meego has a familiar ring. About 3 years ago Phone Arena gave the Palm Pre the highest rating ever given by the site. The tech community was in love with webOS, it was going to be the iPhone killer. Maemo/Moblin/Meego had been around for years and gone nowhere. Microsoft has put their huge financial resources behind WP just to get to 3% of the market, Nokia at its height didn't have that kind of money. Huge developer community? There were no apps! Developers don't have to time or money to develop for small platorms unless someone like MS makes it worth their while, and even they won't always add another platform. It was stupid to cancel either Symbian or Meego, but a lot of commenters are dreaming if they think Meego offered much chance of success for Nokia. You better not forget that Maemo/MeeGo were not advertized, sold in minimum quantity and unprofitable markets. Just imagine what could have been if Maemo/MeeGo were advertized as much as Lumias and were sold everywhere. Also, imagine the amount of developers possible creating apps/games in Qt for Maemo/MeeGo, Symbian, S40, Android, Blackberry OS, etc. You still think it had no chance? I still have an n900, I was rooting for Meego, but unless Nokia and supporters could cough up an MS sized budget to deal with the issues you mentioned, no I don't think it had a chance. The WP ecosystem dwarfs Meego, and even with big support the Lumias, haven't sold that great. It doesn't seem likely Meego could do so with even less to offer. If either Meego or webOS were to become the first 'community based OS" success story I will be delighted. If Nokia went with MeeGo, WP would have been dead by now. MeeGo had so many partners signed for licensing of the OS and app development, however, come Feb 2011, they were showed the bird. Everything was ready and was in house. Feb 2011 was supposed to be N9/N950's unveiling, instead, we got a memo from hell. Nokia was earning profit and was still in a good position. They were losing market share, but don't forget that the market was growing at an intense rate. There were devices churned out by the second by all companies. In conclusion, that memo killed any inhouse OS development. MeeGo and Belle were fantastic and ready, WP wasn't and still isn't. After that memo it took Elop 10 months to release a WP device, a clone of Nokia with much less features. Is that a way to lead? Also, check the reviews of the N9 and how many disappointed customers in all of the world caused by the limited release, high price and end of life announcement ahead of release. In my opinion Stephen Elop should be fired. He is a Trojan Horse, steers Nokia towards Microsoft and even when the company hit rock bottom, no one is 100% sure that M$ will buy them. Maybe for patents, which are so fashionable to have these days :) To me this is the inside job (ruining company in progress) and Stephen Elop is the guy that brought down the tech giant that Nokia once was. Nokia dumped it's rivals when bitchy elop is not around with it's superb quality and great reception of signals. He is the worst for Nokia but the Golden Child for Microsoft. With so much restrictions placed on user functionalities like ios I have no intention to buy a Lumia and be an MS's sheep. just when i was finally accepting the fact the Nokia had killed meego and was moving to windows phone, this happens. Just brought back that bad feeling in my stomach, like i wanna throw up. Elop should be fired immediately. At least, he should have kept his intentions to himself till a few days before launching a nokia windows phone and kept selling the n9 and other symbian phones. Nokia missed a big and great os. Try to get back it Come back Nokia again. WP only strategy was huge mistake, and burning platform memo was even bigger. Too bad that there's probably no time to try anything else atm, they lost too much time, too much cash because of this "transition". Now, we can only hope that WP8 will be success, otherwise Nokia will be no more. Funny thing is, how WP proponents are arguing now with "transition period", for 16 months already. Too bad that Elop didn't gave the same chance for Symbian -> MeeGo transition, which was ongoing when he decided to kill both Symbian and MeeGo. Not to mention, that this transition was doing much better than current WP only transition. Nokia stock rised from 8.15 (july 2010) to 11.73 (feb 2011), until Elop's stupid burning platform memo appeared. Since than, Nokia's stock collapsed, from 11.73 to 1.84. Nokia lost 85% of it's value thanks to Elop. --- Surely, he "saved" some money by cancelling further MeeGo and Symbian development. But he subsequently lost much more, because (almost) no one is going to buy a smartphone based on burning platform. Not to mention that Nokia basicly lost all Qt developers, and loyal fans. --- On top of it, he basicly ignored any new Symbian smartphones, including 808 (all market effort was Lumia), and he did his best to kill N9 (by limiting its availability to selected "not that important" markets). He killed Meltemi basicly two months before it was completed and lost hundreds of Linux and Qt specialists. And he's going to give Nokia's offline navigation to all WP smartphones, basicly giving it to Microsoft. What about this: Free to Nokia, Ecosystem and Nokia own. These are Nokia own, I don't like Nokia, but still there are lot of people crazy about Nokia, so if Stephen choose MeeGo or any OS by their own even from Scratch they could have been in a good shape. I my point of view choosing MS is not good.